EDIT: Giveaway is officially over! Congratulations to the randomly chosen 165th commenter, Darcie K.! Christmas will come twice this year for a lucky lady out there. 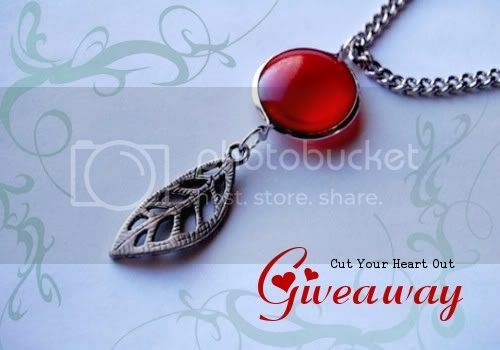 Jessica of Cut Your Heart Out is gifting away her gorgeous Abigail necklace. The elegant design features a 1" metal leaf pendant on a 24.5" medium silver cable chain accented with red acrylic spacers. Nature lovers will love the simplicity of the sole leaf and fashionistas will appreciate the boldness of the red pops of color. Jessica creates wickedly sweet accessories to adorn neck and ears. She abides by a simple philosophy - delight the customer with handmade pieces. She doesn't list anything in her online store that she wouldn't be proud to wear herself. Nor does she believe in putting high price tags on her work. All of her beautiful necklaces and earrings are almost too affordable, starting at only $5! Giveaway is open worldwide. I will be pulling a number from my random.org top hat after 11:59pm EST on December 30, 2010, and the corresponding commenter will win! Jessica will contact that lucky soul for a mailing address. If she doesn't hear back from the winner within 3 days, a new number will be drawn. Mandatory Entry: Walk the dotted line over to the Cut Your Heart Out shop then comment on this post with your favorite item and a way to contact you, preferably an email or Etsy shop. 1. Like the Cut Your Heart Out and aquariann Art pages on facebook. Liking both counts for two entries, as long as you leave a separate comment for each. 4. Follow the Cut Your Heart Out blog for one entry. Follow my blog on Google Friend Connect, Networked Blogs or your favorite RSS reader for another. 5. Spread the word! Use the leaf icons below to share this giveaway on Stumble Upon, Technorati, Digg, Del.icio.us, or facebook. Blog about it or copy and paste the button code below to your sidebar! Start a new Promotions thread on the Etsy forums. Vote for my blog just by clicking Picket Fence Blogs. Whatever you want - I'll honor one entry for every networking website you share it on, just make sure to leave separate comments for each. 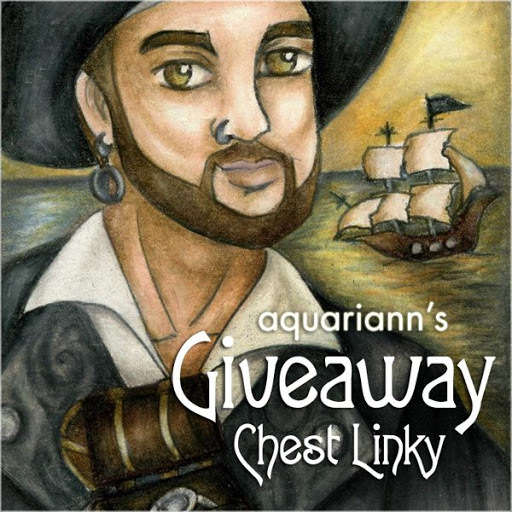 I liked Aquariann Art's facebook page as Tom C.
Love the giveaway! My favorite is the Ricci Necklace, the colors are great. Liked cut your heart out on facebook. I like the Ricci necklace! Simple and clear, like river stones! I love the Lost & Found necklace. Really beautiful! The Lost and Found Necklace is my choice, how beautiful! I think the Lost and Found Necklace is pretty! The birds in the Sophia Grace earrings are precious! I like Cut Your Heart Out on Facebook (Katrina Perkosky)! 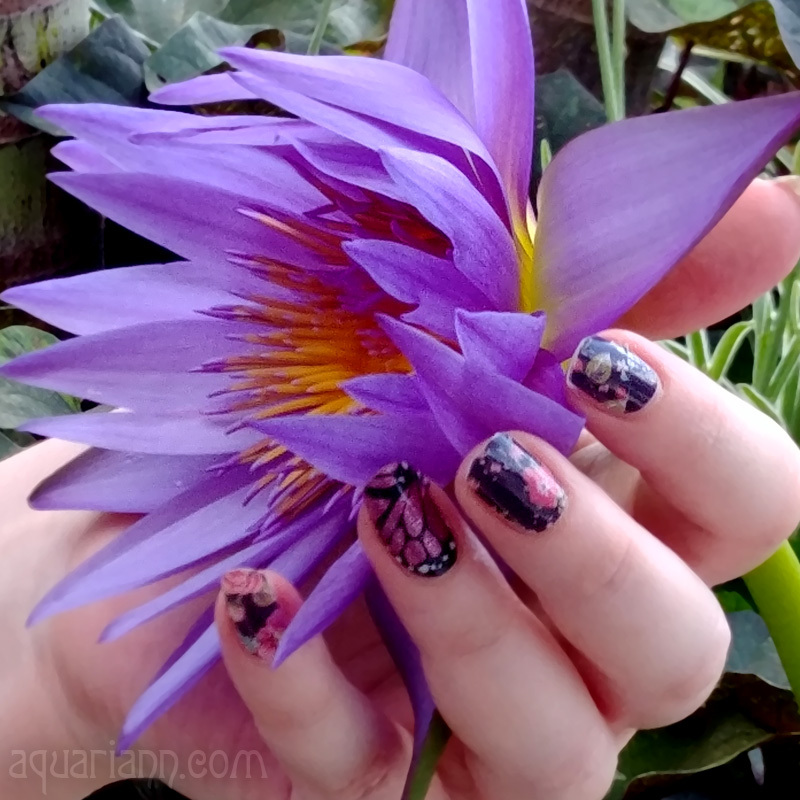 I like aquariann art on Facebook (Katrina Perkosky)! I follow the Cut Your Heart Out blog! I'm following this blog through Blogger! I love the sweet Poppy Grace earrings. I'm a follower on GFC. My favorite item is the Lost and Found Necklace. I posted this giveaway on the Etsy Sellers Giveaway Group on Facebook. I like the leah grace earrings! I love the lost and found necklace! Lost & Found Necklace ! I liked Cut Your Heart Out & Aquariann on Facebook. I tweeted about your Giveaway on Twitter! I follow your blog on Blogger. I follow your blo on GFC. I voted for your blog on Picket Fence Blogs. I posted about your Giveaway on Facebook. You Shell Be In My Heart Earrings are my favorite! :) Thanks for the chance. I like Leah Grace Earrings! Thank you for the chance! I Like the Cut Your Heart Out on Facebook! I like aquariann Art pages on Facebook! Following the Cut Your Heart Out blog! I love the Leopard Jasper Drop Earrings. I'm a GFC follower of Cut Your Heart Out. My fave is this one http://www.etsy.com/listing/63657788/amelia-grace-earrings ! Love the Sophia Grace earrings! Wish their were more! My favorite is the Ricci necklace. The Poppy Grace earrings are my favorite, but I like the colors of the Ricci necklace, too. Hi! I like the Lost and Found Necklace..very simple but so pretty! Thank you for a wonderful giveaway. :) Merry Christmas! I love the Amelia Grace earrings! The Ricci Necklace is my favorite. Thanks! Mandatory entry, I love the Leopard Jasper Drop Earrings! Purrrrrfect! I love the Poppy Grace Earrings. They're so dainty. I'm a new follower with GFC. I like the "My Heart is Rubber and You Are Glue" necklace. My favorite item is the You Shell Be In My Heart Earrings. Very pretty. Please enter me. Thanks! i love lost and found necklace. Love the Lost and Found Necklace. I liked the My Heart Is Rubber and You Are Glue Necklace. I like the Ricci Necklace-simple style and so pretty. Followed the blog via google friends connect! My fave are the AMELIA GRACE earrings! The "My Heart Is Rubber and You Are Glue Necklace" is very cute. The Ricci necklace is my favorite. I cannot believe how affordable your prices are!!!!! The Leah Grace earrings are pretty! i love these! and not a bad price at all! i liked cut your heart out on facebook! aquariann was liked by me. Hi, i really like the Lost and Found Necklace! beautiful! the lost and found necklace is so pretty! My Heart is Rubber - this necklace is absolutely charming. Leah Grace Earrings is really lovely! i like all the jewelry in your shop,but my favorites were Lost and found necklace, Annabelle Grace earrings, and the Leopard Jasper Drop earrings. i like cut your heart out on fb. My favorite is Leah Grace Earrings. My favorite item is the Ricci Necklace. :) Very simple and neat. I like Cut Your Heart Out and on Facebook. My username is wunderfraulein. I like aquariann Art and on Facebook. My username is wunderfraulein. Following the Cut Your Heart Out blog.